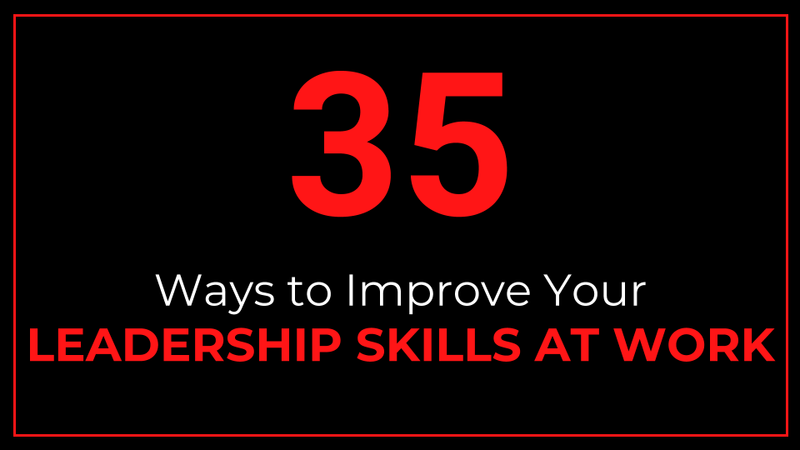 Find out actionable ways to improve your leadership skills at work. Tips include being decisive, crafting a compelling vision, negotiating well, being innovative, having commitment, courage and flexibility, political savviness, managing conflict and building good teams. The first step towards being a good leader is to have the desire to take the lead. Inspire yourself first then inspire others to work with you. Leadership is the process of motivating yourself and others to work towards achieving a specific vision. Leaders provide direction; they keep themselves and everyone else rowing the boat in a coordinated rhythm towards a clear destination. When the boat goes in the wrong direction or loses momentum or faces storms, it is the leader’s role to re-calibrate and refocus efforts back to the right path. A good leader develops a road-map for where they want to go and inspires others to go on the journey. Leadership qualities and skills can be improved through continuous practice and purposefully working towards building your expertise in a particular area, subject or profession. Benefits of leadership skills include career growth, being more productive, getting more results through others, helping others achieve their goals, building more confidence and personal satisfaction. You can quickly skim all the 35 leadership tips on the table of contents below and then click on any tip to read further details. Please enjoy reading. Thank you. One of the qualities of a good leader is the ability to be decisive. It can be tempting to shy away from making decisions especially when you don’t have sufficient information or when the outcome can be unfavorable. A hallmark of a good leader is their ability to make timely decisions. There will be circumstances where your decisions will be good and in other instances your decisions would be bad. Keep working on your decision making skills so that you get more comfortable being decisive and over time aim to make more better decisions than bad ones. In the event that a decision you made turns out to be unfavorable, use it as a learning opportunity and identify lessons learned that can help to improve your future decisions. Closely related to decision making, is the willingness to listen to other people’s input. A good leader makes time to not only solicit other people’s opinions but also genuinely listen to them and probe as appropriate to gather more details. This information gathering process arms you with relevant details for decision making. It also inspires trust among others. Additionally, it helps open a channel for people to talk freely to you and inform you in good time when problems are encountered. In so doing, problems can be resolved in good time rather than learning when it is too late or scrambling at the last minute to put out fires. You do not need to wait for when you are in a managerial or executive position to start developing your leadership skills. You can sharpen your leadership abilities at your current position or level. A few ways to gain leadership experience include volunteering for leadership roles in a team or group activity, planning and leading office social activities, leading meetings and volunteering for leadership roles at local or neighborhood associations, committees or events. These opportunities serve as laboratories to experiment and test drive your leadership potential. They offer a safe place to make mistakes and learn from them. The more you put yourself out there, the stronger your leadership muscles grow over time increasing your capacity to incrementally handle significant leadership responsibilities. It also helps overcome fear or keep it under control and at the same time builds people skills, decision making and risk taking ability. In addition, by volunteering to take the lead, this in turn exposes your leadership qualities to others where they get to see you in action – what you are good at, what you are capable of handling, how you deal with challenges – and people can consider or include you in future activities that require the skills you exhibited. Conduct an internal and external self-evaluation to increase your self-awareness. A few questions to ask yourself include: What are your top strengths and weaknesses? What are your key talents? What are your interests? What do you excel in? What skills do you lack? How do you handle setbacks? Think about the type of leader that you are now versus the kind of leader you aspire to be. How big is the gap between your current leadership level and your envisioned leadership potential? What do you need to do to get to the level you desire? Some characteristics that can help in improving leadership ability consist of your self-drive, determination, attitude, vision and taking action. You can also take personality tests to uncover deeper insights about yourself for example your personality traits, the kind of work environment you can thrive in, career options that you are best suited for, and how you interact with others. Think also about what other people have complimented you on. Are there recurring strengths or weaknesses that are pointed out frequently? Actively seek critical feedback from others and use the information to improve yourself. Focus on improving your strengths over time so that you become as best as you possibly can be and minimize your weaknesses. Think of yourself like an athlete who is training regularly to improve their personal best records, then working towards breaking local records, regional records, national and then international records. Gain inspiration from other leaders. The leader could be someone from any sphere of life who has left a great impression on your mind regarding their leadership ability. It could be your parent, sibling, friend, teacher, coach, principal, professor, boss, coworker, neighbor, local politician, a professional, an entrepreneur, a pastor, an actor, an athlete, a famous person etc. Identify the leadership qualities that you are most attracted to. It can be things such as taking time to listen, sharing the credit with others, keeping their word, trusting others, courage, caring demeanor, being ethical, taking risks, competency, open-mindedness, determination, inspiring people, believing in their vision etc. Learn about their story, the ups and downs that they have faced, top lessons learned in life and words of inspiration. Ways of studying or learning more about leaders you admire include, if the leader is accessible, talking directly to them and asking questions and advice about their experiences. Other ways of learning are reading books and articles about the leader, watching videos, presentations, talks and attending live or online seminars by the leader. A good leadership mentor can help you to improve your leadership skills at work at a faster pace. Ideally a mentor should be an experienced leader. You can also have different mentors at different stages of your career. Similarly, you could have more than one mentor at a time to support you in different areas of expertise. For example, you could have one mentor who coaches you on improving your public speaking ability whereas another mentor guides you in handling conflict management in the workplace. A good mentor should be available, approachable, willing to listen and coach, willing to share their knowledge, offer advice and feedback. Learn how the mentor achieves results through others, how they gain the cooperation of others, how they motivate followers, how they set goals, how they give direction, how they make decisions, how they seek input from others, how they give feedback, how they adapt to different challenges and environments, how they delegate work etc. Once you have identified a suitable mentor, approached them with a mentoring request and they have accepted, the next step is to agree on mentoring goals and a schedule. Specify the kind of support, help or guidance that you need and the duration. Then work with your mentor to determine the frequency of check-in meetings or regular updates. Additionally, identify the mode of communication and interaction such as face to face meetings, conference calls, video conference, email, text messages etc. Most mentors would typically be busy people therefore, it is critical to make the best use of the mentoring sessions that you have available. What do you like about leadership or about being a leader? Why do you want to be a leader? What do you want to accomplish as a leader? What are your short-term and long-term goals? What is your vision as a leader? A clear vision inspires you and others, it acts as a compass, it tells you where you are going, it motivates you and keeps you focused, it helps you to imagine possibilities and opportunities, it gives you a reason to face each day and it helps you to persevere through challenges. Your vision identifies a destination or outcome and then as a leader you figure out a roadmap or route to get you to your vision. A vision depicts a big picture overview; a visualization of the kind of future that you want. The next step is to break down the vision into smaller actionable steps then work towards achieving each step and cumulatively the accomplishment of each step should bring you closer to the realization of your vision. Figure out challenges that you might face and come up with possible solutions. It is also important to share your vision with others who will be working with you towards accomplishing the vision and remind yourself regularly of your vision. Graduate into being a leader by practicing the art of being a follower. An initial step on the path towards becoming a great leader is to be a good follower. Most people have a leader in one capacity or another that they look up to or report to. The leader could be a parent, teacher, supervisor, coworker etc. Listen to the leader, learn from them, be inspired by them, offer helpful and honest feedback and support them as best as you can in achieving their vision. Put yourself in the leader’s shoes and think of how you would want your followers to behave and then embrace those positive behaviors as a follower. Followership helps to exercise capabilities that can in turn serve you well as a leader, skills such as taking initiative, being resourceful, courage to give critical feedback, keeping your ego out of the way, critical thinking, developing rapport and seeking the cooperation of others. One avenue for enhancing your leadership skills is by taking training courses. The courses help to increase your confidence, knowledge and ability to inspire and lead. Leadership training can take the form of on the job learning, classroom teaching, leadership development workshops, case studies and simulations. Sample leadership courses or topics for training can include: how to be a better leader, how to lead people, how to achieve results through others, how to manage teams, how to influence others and how to coach and motivate others. Other typical leadership courses can address how to create and execute a vision, how to manage your emotions, leadership communication skills, increasing your confidence as a leader, how to build teams, conflict resolution, negotiating skills, managing change, problem solving, emotional intelligence and financial management. In addition to training, it is beneficial to stay up to date on industry trends through attending relevant conferences, subscribing to helpful publications and joining professional associations. As a leader, communication skills will serve you well especially in sharing your vision with others. Lack of communication and poor communication are barriers to effective leadership. Good communication is important when sharing information from one person to another. Benefits of clear communication include strengthening work relationships, increasing productivity and collaboration, prioritizing well, increased work satisfaction and saving time and money. On the other hand, effects of poor communication consist of lack of clarity on which direction to follow, confusion where people are unsure of what they are supposed to be doing, low morale, tension at work, stress and gossiping in the absence of information. Other negative effects are reduced productivity, lack of trust, poor customer service, increase in complaints, absenteeism, decreased engagement and employee turnover. Simple ways of practicing good communication skills entail sharing information, offering clear instructions, clarifying, following up, being available to answer questions, providing regular updates and feedback. Additionally take care of the basics such as maintaining eye contact, showing attention by body posture and nodding and paraphrase to ensure you are on the same page. It is important as a leader to teach others what you know, to help them grow and develop in their jobs. You can inspire especially people who are new to the workforce by sharing your career journey – how you started working from your first job up to the present one, the successes and failures you have encountered, what you learned from failures or failed initiatives, and sharing career advice and tips to help other people succeed at work. On the work front you can share best practices and offer training to coworkers, direct reports and interns. When you take time to teach others to become leaders, you can empower them with valuable skills such as how to make decisions, how to prioritize, how to manage conflict, negotiate effectively, plan, set goals, handle challenges, innovate and delegate properly. You also get to learn your knowledge gaps from teaching and responding to questions. This propels you to increase your knowledge to bridge the gaps. In addition, taking time to train others helps you to learn your team at a deeper level and identify strengths to nurture and weaknesses to mitigate. Ways of transferring knowledge from one person to another consist of one on one training, group trainings, mentoring, coaching, giving presentations and job rotation. Other knowledge sharing methods entail preparing learning courses, videos, case studies, manuals, handbooks, guidelines, standard operating procedures, writing articles, drafting policies and developing flow charts detailing processes from the beginning to end. Finally, one of the most critical skills that you can pass on to upcoming and emerging leaders is to train them on how to train other leaders to keep the cycle of knowledge sharing moving forward. Spread positivity at work by cooperating well with your colleagues and caring deeply about the team’s success. Teamwork and collaboration is enhanced when everyone understands what they are supposed to be working on, how their roles are interdependent, what resources are available, how team members can support each other, presence of open or transparent communication channels, regular progress checks and how the leader can keep everyone focused to meet a common goal. Take a long term approach to collaboration by building strong bonds at work and investing in other people’s success through simple methods such as sharing your best practices, being responsive and accountable, taking time to learn your colleagues, helping others, making key introductions and celebrating other people’s achievements. Share tips and tricks on how to perform a task. Assuming you have been working on a specific job for a while, you are likely to come up with unique ways of accomplishing work faster, best processes to follow and where to find needed resources. This kind of knowledge can be really beneficial especially to new coworkers and even seasoned colleagues. When working on tasks or projects within a team, ensure that you complete your assigned work in a timely manner so that you don’t slow down the assembly line, so to speak. It is easy to get caught up in the busyness of daily work. Make an effort to socialize or spend some time with colleagues to chat and get to know each other better – make connections at a human level; not just talking about work. Learn them as a person, what interests them, what they do and even offer to help them during times when they require assistance. Companies face risks of being left behind by competition if they don’t innovate and come up with new or better ways of doing things. Moreover, technological changes are accelerating the speed of innovation. To remain relevant and competitive in their industry, leaders should take some time out of their daily work schedule to think strategically about the future of their company and industry; to envision how things are likely to be in the future, the growth opportunities and threats that are likely to arise, and to start planning now on how to survive the future. Leaders should create a culture that encourages the generation of new ideas. Different ways of stimulating innovation include looking at what works well in one context and seeking to apply it in a different area, reworking old ideas, combining old ways of doing things with new methods, continuously improving existing processes, coming up with brand new ways of doing things, and combining unrelated things, methods and processes to come up with unique solutions. After formulating an idea, the next step is to think through how your idea will work out: What obstacles will you face when bringing it to reality? What resources are required? What are the pros and cons? How long will it take to materialize? Does the idea arouse interest and excitement? How can you convince others that the idea is viable? Not all ideas will work – keep experimenting and testing until you get breakthroughs and use failures as learning opportunities. As an emerging leader, aspire to leave things better than you found them. Make an effort to come up with new, better and improved ways of doing things and add more value. One way to inspire your innovativeness is by reading widely and seeing how other people are solving existing challenges. Think of different ways of achieving your end goals and figure out how to bring the new ideas to life. Ask good questions to understand why things are done the way they are done and ask yourself whether there is a better way of accomplishing a specific activity. Talk to others to exchange ideas and ask team members to give you critical feedback, suggestions and recommendations on your projects and ideas. Talk to users or customers of your products or services to learn how they are using your services, learn what aspects they like, what they don’t like and suggestions they have for improvement. Encourage others to regularly come up with ideas – especially solutions for work problems they are facing – then together sift through ideas to choose viable ones that can be fine-tuned and implemented. Chances are that when you constantly face the same problems at work, you are likely to start thinking of a solution consciously or unconsciously and over time you might just come up with a solution that can transform how things are done. So go ahead and share your proposed solutions with others – they could provide valuable insights and build upon your idea to lead to the next breakthrough innovation for your company, department or team. There is power in a good team. When a team is working together in a harmonious and coordinated manner, their combined output is higher than the output of an individual working alone. This is evident in the office when groups work together on a project, in a business or in the community. The brainstorming power increases and the potential for improving on an idea can be magnified based on each team member’s skills, expertise and capabilities. Many people desire to work in or be part of a successful team. People like and admire a winning team however, building a strong high performing team is hard work. Different team members have varying interests and motivations and the goal of a leader is to ensure that all team members know where the boat is going and that they are all rowing in unison. Things to consider when building a strong team entail knowing the strengths and weaknesses of members, how different skills complement each other, different strengths, perspectives and knowledge of the members, leader’s vision, team roles, team norms or rules, getting team members to know each other, building trust, defining goals and clarifying expectations. Other considerations comprise connecting with individual team members, drawing out the best in each person, encouraging their strengths, empowering others, coaching, measuring progress, taking regular temperature check on morale, members to interact freely during team meetings, being available to listen, big picture connection, resolving conflicts quickly and offering rewards and recognition. As a leader, the quality of being self-directed and going above and beyond is valuable. It entails anticipating a need or a requirement and figuring out how to address the need. For example you can take initiative in building your leadership abilities by identifying free leadership development courses online and undertaking the courses to increase your knowledge. You can also seek a mentor or another leader who can coach you to strengthen your leadership skills. On your day-to-day roles, you can take initiative to carefully study the procedures and workflows involved in planning and executing projects and identify ways to improve processes to save both time and money. Test drive your leadership skills by undertaking additional responsibilities such as volunteering to lead a project and chairing meetings. Take someone under your wings and teach them all that you know to help them to succeed – be a mentor. A leader truly needs to lead by example to create a positive impact on followers. Part of leading by example is defining and setting your personal standards. These are the guidelines that you follow in your daily activities and interactions with others. Aim to be a leader who sets high standards for themselves. For example, when you work on something give it your best efforts and let the results or output be exceptional. Become known as a person who does high quality work and in turn help those you are working with to set and meet high standards for themselves. For instance, when you are leading a particular task or team effort, offer detailed guidance upfront on how the work should be done and provide as many examples as possible of how the final product should look like. Check in regularly on the progress, give good feedback and provide positive reinforcement – offer sincere praise for good work done. Be willing to spend more time to train others at the beginning so that they can soar on their own. Plan time for revisions, edits and correcting mistakes and hold yourself and others accountable for achieving high performance. On a regular basis, work to surpass your previous achievements; strive to get better and better at what you do. There are many reasons why people loose commitment, dedication, momentum, motivation or give up, for example being overwhelmed by the big picture or goal, not knowing or not sure where or how to start, procrastination, the work involved is too hard or takes too long, lack of patience, lack of support, boredom, not seeing immediate rewards, distractions and fear of failure. More causes of lack of commitment are failure to prioritize and trying to do too many things at once, not believing that you will succeed, facing uncertainty and unknowns, giving up as soon as you run into obstacles or face opposition, negative thinking, exhaustion, burnout, worry and feeling like others are making more progress than you. Ways of maintaining commitment consist of prioritizing work, breaking down goals into smaller milestones, giving yourself deadlines, tracking your progress, appreciating or valuing incremental small efforts and wins which add up over time, taking regular breaks to recharge and maintain momentum, and motivating yourself regularly. Other ways entail enlisting the help of others, talking to others who are achieving their goals and building a supportive ecosystem of encouraging and supporting each other, learning from failure, being accountable to yourself and others, regularly reminding yourself of your vision – why you are doing what you are doing, persevering and determining to see things to the end. As a leader you will have to be courageous and take risks from time to time. It does not mean that you won’t be fearful; in fact you could encounter and battle with feelings of fear and self-doubt each time you take a risk. Over time, the more you take calculated risks, the easier it becomes to manage fear especially when you strongly believe that what you are doing will benefit many. Ways of being courageous at work include: asking questions, owning up to your mistakes, persevering when facing opposition, volunteering to lead projects, proposing an unpopular idea, when going against the tide or breaking from tradition or questioning the status quo, proposing new changes and defending your opinion when you believe strongly in it. Other ways of being courageous at work entail making suggestions or recommendations for improvement, proposing a new idea, product or service, giving helpful feedback, speaking up in meetings, giving public presentations, advocating for others and pursuing more challenging roles to grow your leadership skills. Leaders can’t possibly do everything by themselves hence the need and importance of redistributing work and achieving results through others. Delegation should not be used as a tool for dumping unpleasant tasks to employees rather it should be viewed as an opportunity for improving productivity and giving subordinates a chance to try their hand on new tasks and responsibilities. Delegation is also a strategic tool to help leaders focus their time on important priorities and also to have more time to manage their teams and attend to team members. When you have handed over tasks to subordinates, ensure that you give clear instructions on what the final output should look like, when the work is due and be available to answer any questions or provide clarifications as needed. Some leaders are apprehensive about delegating because of reasons such as wanting to do all the work by themselves, not trusting that others can do a good job, unwillingness to commit the time involved in training someone on a new task, and fear that employees might do a better job than them and outshine the leader. You have to be confident enough in your abilities as a leader and also trust that your team can rise up to the occasion. It is true that it can take more time at the beginning to get employees up to speed when you delegate a task, however view this as a long term investment because once the employee gets on the driver’s seat they can free your time to train others or do other high level tasks. In addition, the employee that you have trained can in turn cross train others. As employees get used to being trusted with more challenging responsibilities, this can help to motivate them and increase their job skills. Delegation can even create a path towards a job promotion where as an employee accomplishes progressively challenging responsibilities they in essence demonstrate that they are capable of performing at a higher level than their current position. Good listening skills are essential to succeed as a leader. With so much information and distractions competing for our attention today, it is easy to let listening skills slip and this can lead to poor communication and misunderstandings. When you really take time and effort to listen attentively, it helps the other party to feel acknowledged, understood, appreciated and respected. Simple strategies for active listening include maintaining eye contact when talking with someone, smiling, asking probing questions to gain better understanding, taking time to give proper explanations or guidelines, answering clarifying questions, and remembering and using people’s names in conversations. Other tips are giving undivided attention, not interrupting the other person when they are talking, and paraphrasing or repeating in your own words what you have just heard to ensure that you understood correctly and are on the same page. The best laid prioritization plans can be devoured by a lack of focus. From time to time, lack of and loss of focus can plague even the most efficient leader. Reining in focus requires will power especially with so many distractions around us. Loss of focus can emanate from wandering thoughts to email overload or notifications to colleagues chatting to a messy desk to boredom and even lack of motivation. Tips on how to stay focused at work include the following: using your to-do list to guide your work day, organizing and decluttering your workspace and desktop, maintaining a good filing system, focusing on one activity at a time, doing complex projects during your daily peak productivity periods and working with team members on group activities. Other tips are using deadlines to keep you on track, being aware of what causes you to lose focus, switching off notifications, taking small breaks to get re-energized, adopting proper sitting posture, staying hydrated during the day and turning off email when doing important work. Additional ways of staying focused are tracking how much time you spend on an activity, avoiding browsing the Internet especially social media websites, working offline/without Internet connection where possible, listening to your favorite music and motivational messages as you work, getting adequate sleep, rest and nutrition, and working from home or working remotely. It’s a simple fact that you can accomplish more by working with others and also you never know who can be in a position to help you when you require assistance. Aim to network widely and develop strong bonds with others. Network with people from all walks of life, be genuinely interested in them and aim to provide as much value as you can. Work on building your personal brand and reputation so that people can become interested in networking with you. For example you can become known for being adept at a skill such as negotiating, problem solving, public speaking or selling and then help people in the areas that you are skillful in. Networking is a never ending activity. A best practice for networking is to network as often as you can; don’t network only when you need something from others. Likewise, when networking focus on quality over quantity – ask thoughtful questions, and learn and connect at a deeper level. Simple ways of networking include: having lunch with coworkers, participate in company-wide activities, collaborate on inter-departmental projects, seek speaking opportunities, attend events, conferences or workshops, join professional associations, write articles and produce videos and podcasts for relevant websites, share your knowledge widely and reach out to key outstanding professionals within your profession or industry. Help others build their networks – be a connector and connect other people, mentor new workers, participate in alumni groups, join local meet-ups, talk to customers, vendors and suppliers, chat with exhibitors at trade fairs, offer referrals and recommendations, attend networking events also network online. A solutions-oriented mindset is one arrow in a leader’s quiver of arrows. A leader should be capable of stretching their bow, pointing their arrow towards problems and aim to hit a bulls-eye as often as practically possible. Problems abound in the work place. Each day presents a new set of challenges to be overcome. Pull out your telescope, so to speak, and look into the distance to see where the storms of trouble are blowing and actively steer your ship away from the problematic path. At a basic level, there are three distinct problem solving situations, stages or scenarios namely: solving a problem before it occurs, solving a problem as it occurs, and solving a problem after it has occurred. The first scenario entails anticipating which problems are likely to occur. This can be informed or guided by similar problems that have happened in the past which we now seek to prevent from happening again. This scenario can likewise be guided by brainstorming a process from the beginning to the end, identifying ahead of time gridlock areas and undertaking preventative maintenance to avoid problems or reduce the severity of problems should they occur. The second situation consists of handling a situation as it unfolds or solving a problem as it occurs – in real time. This requires quick thinking to determine what should be done immediately to stop the problem or keep it from getting worse. The third scenario comprises of resolving a problem after it has already occurred – What should be done immediately? What should be done next? What is the order of activities? What help and resources are needed? Who should do what, when, where, how etc.? At a minimum, a problem solving sequence should seek to understand and do the following items: What is the problem? – Define it. What is causing the problem? Dig deeper. What are the possible solutions? What are the pros and cons of the solutions? Which option offers the best answer? What do you need to implement the solution? Who will handle what? What can we learn from the problem? Other tips to help in problem solving include finding out who has solved similar problems in the past, documenting the known solutions, dissecting the current problem and breaking it down into smaller components, and revisiting the solutions implemented to check if they work or not and if not, refine the solution or try a new solution. Negotiating is a part of our daily lives. People often negotiate about things such as price, job offers, salary, benefits, raise, promotions, discounts, agreements, contracts, specifications, scopes of work, deadlines, work arrangements, roles and responsibilities, processes, bills, interest rates, renewals, extensions, deadlines, time off, schedules etc. In a simple negotiation between a seller and a buyer, the seller could be seeking to get more money for their goods or services whereas the buyer could be looking for more value, more options, lower prices, discounts and better terms such as free returns if they are not satisfied with a purchase. In a typical haggling or bargaining process, the seller would quote the highest price and the buyer would propose the lowest amount. The ensuing negotiation would be geared towards an equilibrium where both parties feel comfortable with the final transaction. Before you begin negotiating, be clear in your mind regarding what you want to accomplish from the negotiation. Conduct adequate research, prepare well, organize your thoughts then calmly and clearly state your requirements, needs, point of view and reasons. Decide how much ground you are willing to concede or let go to reach a mutually beneficial agreement. Listen carefully to the other person’s requirements, demands, concerns or point of view. Ask relevant questions to gain better understanding or to seek clarification on what the other person wants. Ensure that you understand each other and look for areas of agreement and disagreement. Compromise or make concessions to meet each other halfway. Despite your best efforts and intentions, negotiations may not always go your way. Your offer could be rejected or your needs might not be met adequately. Sometimes the best course of action is to be willing to walk away if you can’t get your absolute minimum from the deal. A good leader is one who motivates their staff, has their best interests at heart, is always looking out for their team and gives good direction. A good leader is one who knows when to step aside and let their staff shine, encourages and supports them to perform at their level best, creates a safe working environment and provides professional development resources. A good leader is one who is approachable and staff can trust the leader with confidential information, they genuinely take time to talk with their team and understand their concerns and ambitions. Ways to motivate others entail recognizing and acknowledging people’s contributions, offering challenging or stretch assignments to expand people’s abilities, seeking people’s input, empowering others and sharing regular company updates. Other motivational methods consist of talking to people to find out what motivates them, providing incentives and rewards, offering flexible work schedules, showing employees how their work supports the big picture and nurturing people’s potential. Flexibility and adaptability are woven into the fabric of leadership. Great leaders know that things don’t always go according to plan and they are willing to make changes to seamlessly deal with twists and turns, urgencies and emergencies and changing priorities. One way to strengthen your flexibility as a leader, is to take time to learn your team members strengths. Each person’s strengths can determine how much flexibility is needed when leading them and to appropriately match the level of your support needed. Some people require big picture guidelines and are able to move forward and figure things out on their own, others require a more hands on approach, whilst others require regular check-in meetings to debrief. Aim to regularly review and improve processes seeking input from front-line staff. Find out what is working and what isn’t. Ask your team what challenges they are having and keep open frank lines of communication. Take time to listen to employees, how can you best accommodate their requirements, figure out what tools, methods, processes and work arrangements can help your team to perform at their best. On the other hand, adaptability involves opening up your mind to different ways of thinking, new ideas and different ways of doing things. An adaptable person is able to calmly deal with different situations without getting frustrated. They are able to bounce back quickly when priorities change or when new challenges emerge. Endeavor to quickly adapt to changing circumstances, adapt to changing ways of working, customer demands, competitive environment, technological changes and also embracing new ways of thinking, working and collaborating. It can be disheartening when you have put a lot of effort or spent a lot of time working on a task that will benefit a company in one way or another and not receive even a simple ‘thank you’ for your effort. At a basic level, when you are appreciated or recognized for your accomplishments, you feel re-energized, happy and enthusiastic and it increases your drive and desire to want to do even better work. Sometimes leaders forget the power and importance of praising or appreciating their team members, yet this simple gesture is motivating, encouraging and uplifting. When an employee does an exceptional job, as a leader you should express your appreciation in a timely manner. You can give positive, useful and specific feedback in private or in public. The good habits and performance that are praised and appreciated are likely to be repeated. Make it a habit to celebrate small wins. Additionally, when a major activity has been successfully accomplished, take time to recognize the people who contributed. As a leader you can motivate your team through transparency by endeavoring to share regular and relevant information so that everyone is kept updated at all times. By acting in an open and honest manner, you inspire others and build trust. In a transparent work environment, people are able to talk freely and respectfully with each other and this can provide benefits such as better collaboration, stronger teamwork, more productivity and higher engagement. On the contrary, lack of transparency and communication breeds rumors, gossip, mistrust, complaining, uncertainty and fear. Ways to promote transparency at work include sharing both the good and bad news about the company, having honest discussions about problem areas and working together to identify solutions, being accessible and open to questions from employees, providing clear instructions and guidelines and being available to offer clarifications. Other transparency tips are: listen to and address complaints as appropriate, encourage sharing of ideas within the company, share the organizations vision or strategic direction regularly and listen to feedback from customers and other external stakeholders. One mistake that an upcoming leader might make is not being politically savvy. You might be creative, innovative and full of bright ideas and still find yourself running into resistance when you propose new ideas. On one hand, you could have worked extra hard on an idea only for it to be dismissed unceremoniously whereas on the other hand, you observe others who have worked equally hard on their ideas and seem to get a lot of buy-in and support. You question where could you be going wrong? One reason could stem from the fact that you haven’t invested enough time to learn how power and influence operates or flows within a particular organization. It is vital to understand the political landscape of an organization to be effective as a leader – a leader needs to manage office politics well. In any company, there are people who have formal power by virtue of their positions and those who have informal power and influence. When they suggest or propose something, people tend to listen and support their suggestions. Identify people from both camps and work on getting to know them, build alliances with them and run new ideas through them. In a genuine way, solicit their feedback and input. Moreover, things might not move as fast as you would like within an organization. In this case, cultivating patience is helpful as your ideas work through the organizational systems and established processes. Even if you have completely figured out a new concept on your mind, slow down to let others digest the new proposals, suggestions or information and take time to help others understand your ideas and the benefits. Listen to feedback after you offer your suggestions; what are the areas of concerns, what was not clear, what needs to clarified and use this information to make necessary revisions. Other approaches of increasing your political savviness include learning as much as possible about the company including its history, vision and the future strategic plans and goals to understand how the company works, and build working relationships across all levels of the organization. It starts with a simple hello, good morning and good evening then gradually progress to get to know people from different departments. Other tips are: talk to successful people in the company to learn best practices for navigating office politics, genuinely support other people’s ideas and projects, include other people’s input in your projects, join and contribute to informal and formal committees in the office. Do your job very well, build your credibility, become known as a top performer who consistently does good quality work, support your boss and help them to be successful, seek your boss’s support, propose solutions to major challenges and help where possible in implementing them. Another option is to implement ideas in phases, when people start seeing the benefits from the initial phases, they would be more open to the next phases. When you have major presentations, prepare well and gather all necessary information. One approach is to meet people individually to share your ideas prior to big group meetings. Other political savvy tips entail treating others with respect, practicing diplomacy, and making your direct reports look good to higher ups e.g. by assigning them highly visible projects. For me, maintaining confidence is something that I regularly struggle with. My confidence goes up and down like waves in an ocean. In one circumstance my self-confidence can be up and in other instances it goes down. Situations where my confidence takes a beating include when I am facing an uncertainty such as will I succeed or fail, when in an unfamiliar environment, when going through a big challenge, just before a presentation, when starting a new job or when facing a lot of rejection. In these situations, I am not sure what the outcome would be and fear sets in. I aim to encourage myself by thinking about challenges I have overcome in the past and believing that if I give my best efforts, I can overcome the present challenge too. There are many things that cause people to lose confidence at work such as a boss that puts you down, a nitpicking coworker, skills falling short, when facing stiff competition, your ideas or opinions being ignored, being too hard on yourself, doubting or second guessing your abilities, fear of failing, fear of looking bad and fear of taking a risk. Ways of building your self-confidence include the following: pushing yourself out of your comfort zone, challenging yourself to do harder tasks or meet new people, mingling with people who help you to grow, being kind to yourself when you make a mistake – learning from it and moving forward, using your strengths to your advantage and tracking your past accomplishments. Other confidence boosters consist of believing in your ideas and sharing them passionately, taking risks and learning from them, rewarding yourself when you achieve a personal goal, forgiving yourself and others, avoiding the trap of constantly seeking the approval of others and not taking it personally when someone challenges your point of view. Additional tips for improving self-confidence encompass seeking and being open to corrective feedback, improving your body language, dressing well and comfortably, not getting caught up in perfectionism, not comparing yourself with others, identifying your fears and working towards overcoming them, uplifting yourself with empowering thoughts, helping others and creating boundaries. As a current or future leader, you will face your fair share of conflict at the workplace. In these cases, conflict management is a skill that will serve you well. Conflicts can vary from minor misunderstandings to explosive disagreements. Conflicts could arise out of misunderstandings between yourself and an employee, disagreements between coworkers, conflict between an employee and their supervisor, between teams or departments and even conflicts between managers. Even though conflict is stressful, it may not necessarily be a bad thing. It could signify that there is something that needs to change to improve work output. It can also strengthen working relationships once the conflict has been resolved. When left unresolved, conflicts can lead to stress, tension, frustration, disappointment, anger, communication breakdown, lack of trust, unhappiness at work, lack of collaboration, hostility, gossiping, absenteeism and even staff turnover. It can be tempting to ignore conflict and hope that it will go away, however, unresolved conflict can escalate leading to heated arguments, pointing fingers and blaming each other, loss of productivity and even affect others who are not involved. More often than not we feel that the other party is to blame and they should see things from our perspective, usually each person has a role to the conflict. Steps in resolution can vary depending on the severity of the conflict; the more severe the conflict, the more steps and intervention would be required. A leader does not have to be involved in mediating all conflicts in the workplace. It is helpful to encourage and train employees to actively resolve conflicts on their own. In other situations, employees may be unable to resolve the conflict on their own or there could be too many emotions or hurt egos involved that it would necessitate a third party to arbitrate. Steps on how to resolve conflicts at work include the following: identify ample time and a place to listen to the conflicting parties, find out what is the problem or source of conflict – what specific actions or behaviors caused the conflict, ascertain why the behavior happens – when did it start or happen, find out how the conflict is affecting the employees and others, and determine if they have tried to resolve it on their own. The next steps are to keenly listen to both sides and paraphrase your understanding of the conflict, probe to find out more information to get to the bottom of the issue, ask what solution the employees are seeking, identify possible solutions and examine the pros and cons of each, work together on a solution, restate what has been agreed and how the solution will be carried out, follow-up at some point to see how things are going, and thank the parties for their efforts in resolving the conflict and maintaining the solution. A distinctive characteristic of an effective leader is having a vision. Once you have the big picture overview of what you want to do, the next step is to think in advance how to achieve your end goals. Leaders are constantly planning, preparing, prioritizing and executing on different tasks at any point in time. Taking time to plan helps one to save time, manage available time well, be efficient, more productive and achieve better results. Planning ahead helps one to think through and visualize what needs to be done, by when, identify the resources required, allocate responsibilities, stay focused, follow-up and provide feedback, support or corrective action and at the end of the process do debriefs to learn what went well, areas of improvement and expressing appreciation for everyone’s input. Methods of planning well consist of being organized, conducting necessary research, gathering information, seeking the input of other people, writing down your plans and making decisions. Additional steps entail thinking of possible failure points and how to manage challenges as best as you can, sharing plans, prioritizing using tools such as a to-do list, executing tasks, monitoring progress and making adjustments to your plans as needed. A humble leader is one who is not arrogant, boastful or proud. When a leader looks down on others, it sends the wrong signals to followers. It can also be annoying and a turn off. On the other hand, being humble does not mean that you are a pushover, a doormat or people can walk all over you. A humble person realizes that it is not just about them, they are able to focus on other people and the big picture that the company is aiming for. A humble leader lets their good works and accomplishments speak for themselves rather than rubbing it in or being braggadocios. Humility is enhanced through self-awareness – being aware of how you talk and act, how you respond to others and recognizing your shortcomings and weaknesses. Ways to be humble include owning up to your mistakes, being willing to learn and be corrected – being teachable, acknowledging you don’t have or know all the answers, recognizing, valuing and acknowledging other people’s talents, opinions, inputs and contributions and celebrating other people’s successes. Other avenues for practicing humility comprise being respectful, courteous and considerate, caring about others, sharing the credit, seeking feedback to improve yourself, asking for help when you need it, listening keenly, avoiding nitpicking, fault finding or being judgmental and being a good follower. Having a good and positive attitude makes it easier to get along with other people. It also gives you a positive outlook on life and helps you look forward to each day. It doesn’t mean that you will be happy all the time. Even when you encounter challenges, you don’t let them put you down. You may feel down momentarily but you find strength to bounce back and keep going. People enjoy being around others with good attitudes. A leader with a good attitude creates a positive work environment that stimulates their team and keeps employee morale high. Ways to maintain a good attitude include: being grateful for the positive things that are happening in your life or counting your blessings, surrounding yourself with other people who have good attitudes, limiting negative thoughts and negative self-talk, and regularly reading, listening or watching inspirational, motivating and uplifting messages. Other ways are being kind to others, helping others, graciously accepting compliments, controlling your temper, forgiving others, laughing and smiling, seeing challenges as an opportunity to grow your strengths and resilience, solving problems, developing goals that you aim to achieve and consistently taking small steps to accomplish your goals. How would you feel if you were going through something, struggling with something or concerned about something, and then shared it with someone and they were dismissive, disinterested, distracted or ignored you? You would definitely not feel happy if this situation happened. Instead you would prefer if someone took time to listen to you and understand you. Likewise, a leader who has empathy makes an effort to understand how others are feeling by putting themselves in someone else’s shoes and seeing things from their perspective. Empathy includes taking an interest in others, learning them on a human level and listening to their interests, aspirations, hopes and concerns. While at the same time refraining from being judgmental, jumping to conclusions about others or trying to fix what someone is going through. Benefits of knowing and being aware of how others are feeling include helping one to be more patient with others and cultivating stronger interpersonal relationships or connections. Other benefits are: opening you up to seeing things from other people’s perspectives or points of view, being more considerate and compassionate and helps in managing conflicts when the other party feels heard and understood. Becoming a good leader takes time and effort. With strong determination you can improve your leadership skills and work well with others to achieve your vision and shared goals. This article has broken down ways to develop your leadership ability in the workplace, put these ideas to work for you. I hope that this article encourages and inspires you to achieve your highest potential as a leader in both your career and your personal life. May you flourish, prosper and succeed as you build your leadership skills. Find out actionable ways to improve your leadership skills at work. Get guidance on decision-making, negotiation, conflict resolution, innovativeness and political savviness.